The Bulgarian Black Sea Coast blankets the country’s entire eastern side, extending more than 230 miles (almost 380 kilometers) from Romania in the north to Turkey in the south. The area—known for its sand dunes, riverside forests, wildlife conservation parks, and protected plant and animal species—draws millions of foreign and local tourists each year. Until 2014, there was no centralized database with information about the main features of Bulgaria's Black Sea Coast, like this estuary on the Veleka River in the country's southeast. 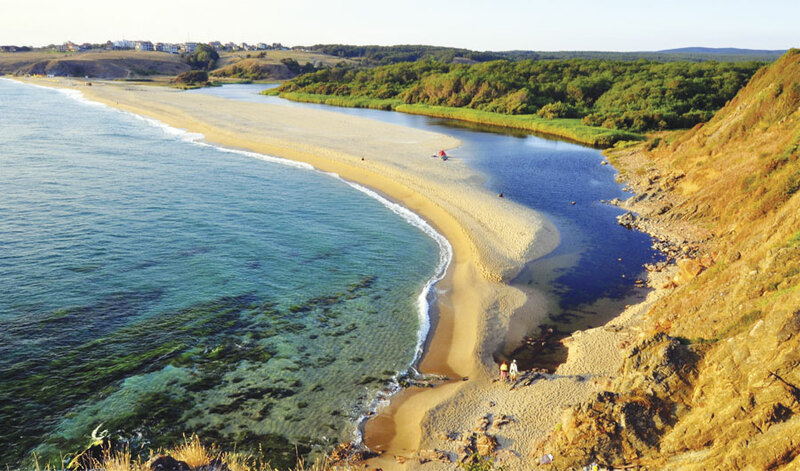 Until 2014, there was no centralized database with information about the main features of Bulgaria's Black Sea Coast, like this estuary on the Veleka River in the country's southeast. Ensuring that tourism is sustainable and doesn’t interfere with the management of protected areas—whether public or private—requires enhanced cooperation and concrete partnerships among government, the tourism industry, local communities, managers of protected areas, and planners. It is crucial that all parties have access to good-quality cadastral and specialized data for the Bulgarian Black Sea Coast. Bulgaria’s Geodesy, Cartography, and Cadastre Agency (GCCA), within the Ministry of Regional Development and Public Works, is responsible for creating and maintaining cadastral maps and registers for the whole country. The agency’s priorities include providing administrative and technical services to citizens, organizations, municipalities, and others who use cadastral information, as well as maintaining the national geodetic, mapping, and cadastral registers. In carrying out these responsibilities, GCCA faces many challenges. There is no single, centralized database for the cadastre (a register of property showing ownership, boundaries, and real estate values) or the main features of the Black Sea Coast, such as beaches, dunes, lakes, lagoons, infrastructure, and buildings. Different contractors from various agencies collect data and create specialized maps and registers in distinct ways. The resultant data is heterogeneous and often inconsistent. This hinders effective land management and slows down the delivery of technical and administrative services to governmental organizations, municipalities, and citizens. So in 2014, GCCA launched a project to develop a GIS for a specialized map of the Black Sea Coast that could aid in delivering administrative services online. The project was funded under the Operational Programme Administrative Capacity. Esri Bulgaria Ltd., Esri’s distributor in Bulgaria, was selected as a leading partner to develop and implement the system. The development of GIS for the Black Sea Coast cadastre was an IT project of national importance. On one hand, it aimed to support the municipal and state organizations that govern ownership, construction, and environmental preservation. On the other hand, it also needed to provide for citizens and private companies with investment interests in the area. 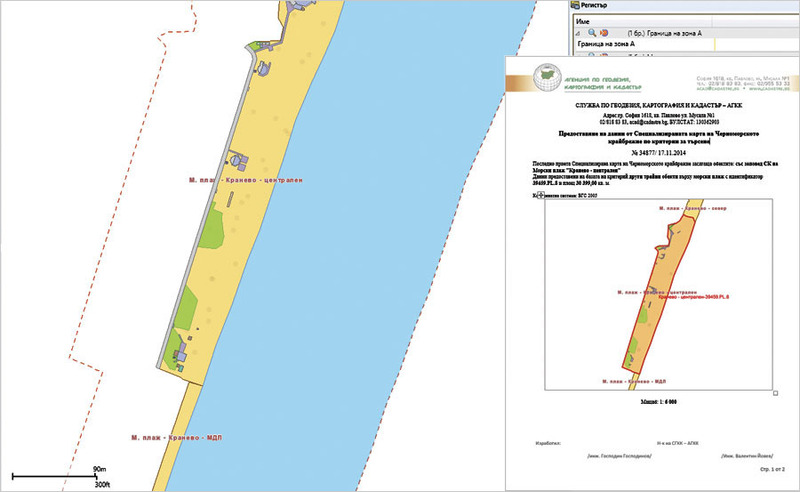 The Geodesy, Cartography, and Cadastre Agency (GCCA) can now use the specialized map of the Black Sea Coast to provide online administrative services, such as sending a requester this map and object information for the central beach in the village of Kranevo. To achieve these two objectives, Esri Bulgaria’s team first analyzed how objects in the specialized map and registers were regulated and classified in accordance with the Black Sea Coast Spatial Development Act, which seeks to protect the coastline while allowing for its sustainable, integrated development. The team also analyzed GCCA’s processes and studied all of its available data, including the organization’s IT systems. Based on this analysis, Esri Bulgaria designed a GIS for the Black Sea Coast map that employs ArcGIS for Server and ArcGIS for Desktop to create and maintain one centralized database with powerful functionality. Esri Bulgaria developed seven functional modules as part of the system: a central GIS module, an e-services component, a reports module, integration with two of GCCA’s IT systems, an import/export function, and an administrative component. Esri Bulgaria processed, validated, verified, and incorporated more than 500 types of objects into more than 50 layers in the geodatabase. The objects included coast protection systems and equipment, sea lakes, lagoons, estuaries and wetlands, islands, the Black Sea’s water area, infrastructure, and buildings. With this, the GIS module enables GCCA’s experts to identify all the Black Sea Coast objects on a dynamic map, as well as edit the associated spatial and attribute data, perform analysis, and review relevant documents. 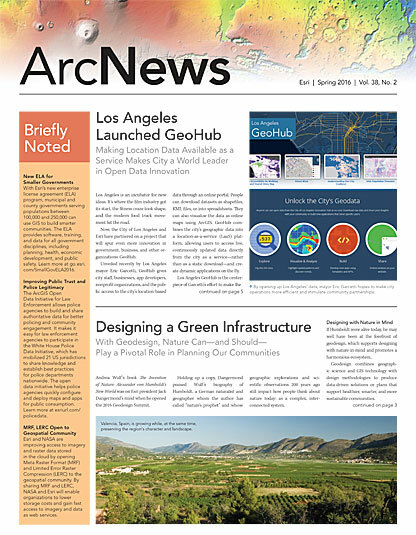 Additionally, the module automatically performs quality control on the data—assessing the information’s completeness and making sure objects have logical relationships, for example—to ensure that the content and structure of the geodetic measurements coming in from third parties are consistent and can be easily analyzed. This is again in line with the Black Sea Coast Spatial Development Act. The integration with GCCA’s two IT systems was essential. One of them, KAIS, is an Internet portal for searching and accessing cadastral map and register information. It handles administrative service requests and provides users with sketches of cadastre map data combined with information from the specialized map of the Black Sea Coast, samples of objects from the map along with their technical characteristics,and a list of coordinates (including altitude) for detailed points on the map. With streamlined cadastre data and the improved ability to deliver administrative services online, the GIS for the Black Sea Coast map was deemed a success. In fact, in a competition organized by the Bulgarian Association of Information Technologies, it was ranked among the top three IT projects for 2014 in the state administration category. Computerworld Bulgaria also nominated it to be recognized as IT project of the year, in the category for national government administration IT projects. For more information, email Violeta Koritarova, project manager at the Geodesy, Cartography, and Cadastre Agency, or Miglena Kuzmanova, account manager at Esri Bulgaria.